In my writing and photography I try to stay as true as possible to my own observations and impressions. 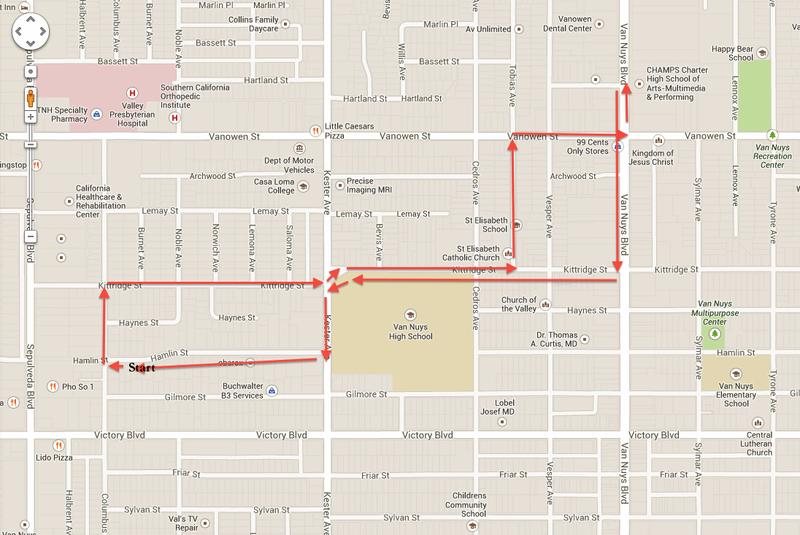 Such was the case when I took a long walk through one small portion of Van Nuys, encompassing an area roughly from Columbus on the West, Kittridge on the South, Vanowen on the north and Van Nuys Boulevard on the south. What I write and show today is just how I saw it. Tobias Avenue , north of Kittridge, south of Vanowen, is a not-so-shabby street of single family houses, mostly quiet and mostly homely, some with open lawns, others encased in iron and cinderblock. The population is quite diverse, with surnames that include Beasley, Bowser, Lange, Cohen, Funes, Moran, Lucas, Suh, Phung, Avetisyan and Ayanyan. 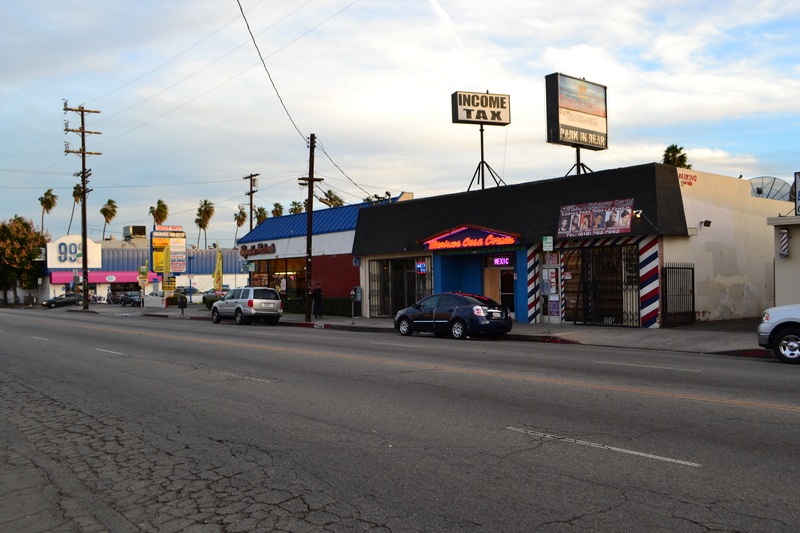 On Vanowen, between Tobias and Vanowen, the stores are packed closely together, up to the sidewalk, and commercial Van Nuys is at its epicenter. It was Sunday afternoon, so the loudest noise was coming from the open doors of a storefront Spanish church, where the indoor parish was singing. There was little pedestrian traffic, other than those few waiting for buses at trash littered Metro stops. 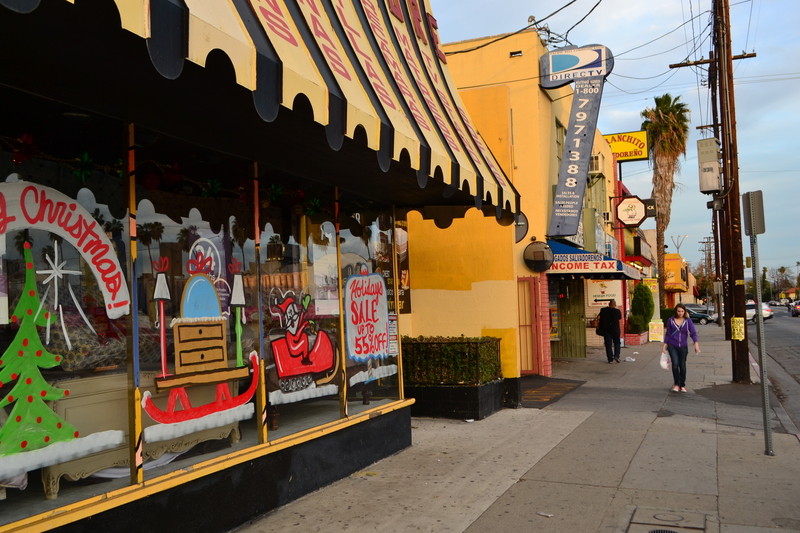 The businesses along here cater to Spanish speakers, advertising income tax for Salvadorenos, party rentals at Teffy’s Jumper, Inc. and dining at Mi Ranchito Salvadoreno (14523 Vanowen St.) Buildings are painted exuberantly in vivid sunshine yellow with red lettering. A dismembered tree, its limbs hacked off by ignorant tree trimmers, stood near the corner of Vanowen and VNB. 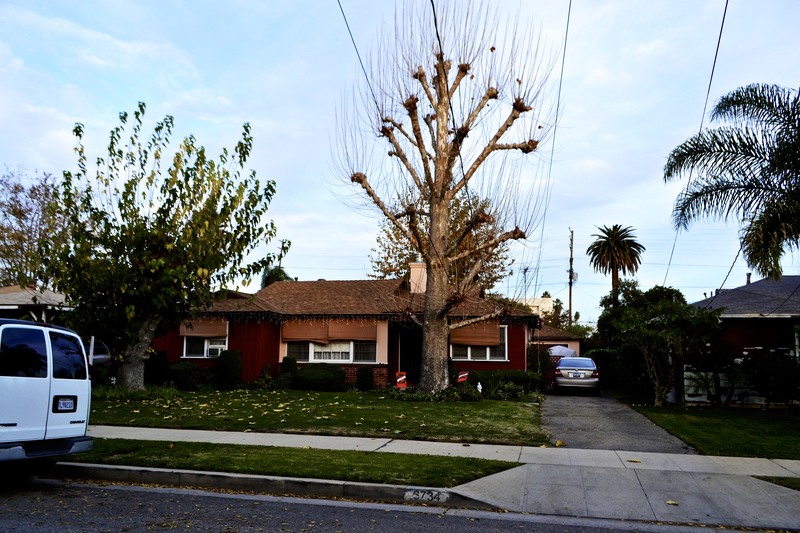 The disfigurement of trees all over Los Angeles is characteristic of this city, an appalling sight for nature lovers and for those who respect arboreal rights. 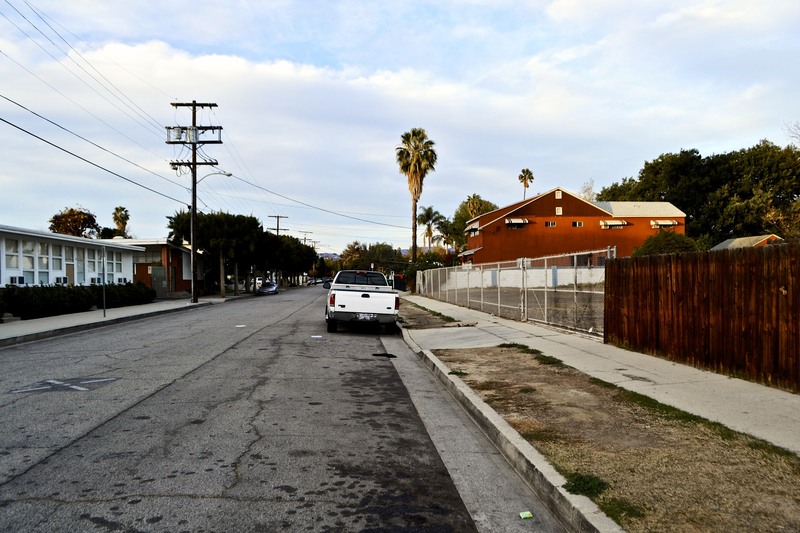 Trees are needed most in this area of Van Nuys, for the streets are overly wide, and the sun beats down here, making the district hellish during the long hot summer. 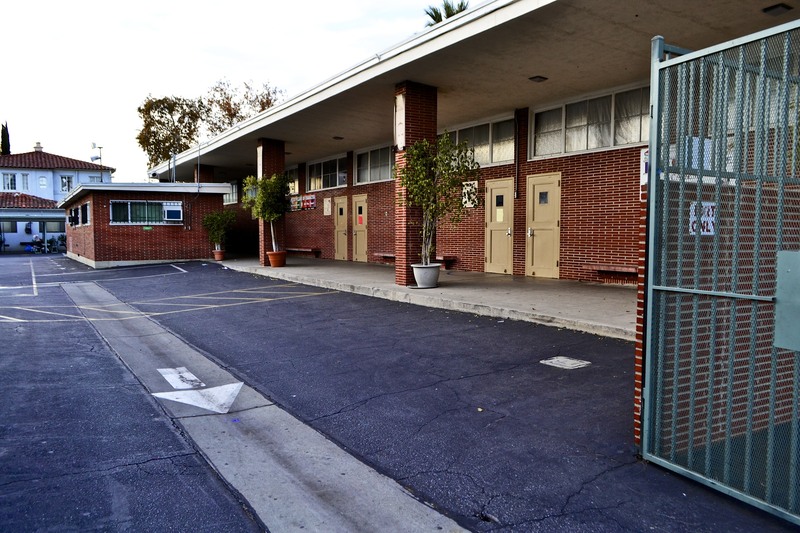 6842 Van Nuys Boulevard is the new home of Champs High School of the Arts, a charter school which makes its home in a 1963 mid-century office building. The structure has been jazzed up on the exterior, with new lighting, stone and chrome to appeal to the more luxuriant expectations of modern Americans. Hacked onto the south end of 6842 is an inexplicably ugly new structure, set back from the street, like an awkward wallflower at a high school dance. Here again is where urban Van Nuys always go wrong. 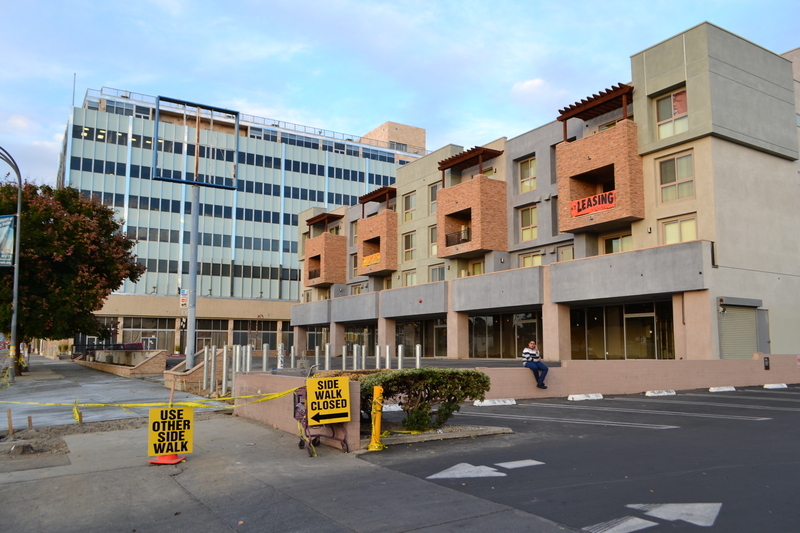 Hundreds of millions of dollars were spent to erect a building that does not participate in the architecture or functioning of the boulevard at all, but rather sits back, in boxy ugliness, behind an asphalt parking lot, its untenanted stores and unoccupied apartments begging for respect, with broken and boarded up windows already advertising its failure. Van Nuys Boulevard is six lanes wide. So setting a new building back only reinforces the funereal deadness of the street. In order to bring pedestrians back, you need to make an environment that encourages pedestrianism. The new building is banal, striped in bands of colors that are supposed to reduce the imagined bulk of the façade, but instead reduce it to insipid sections of paint strips. 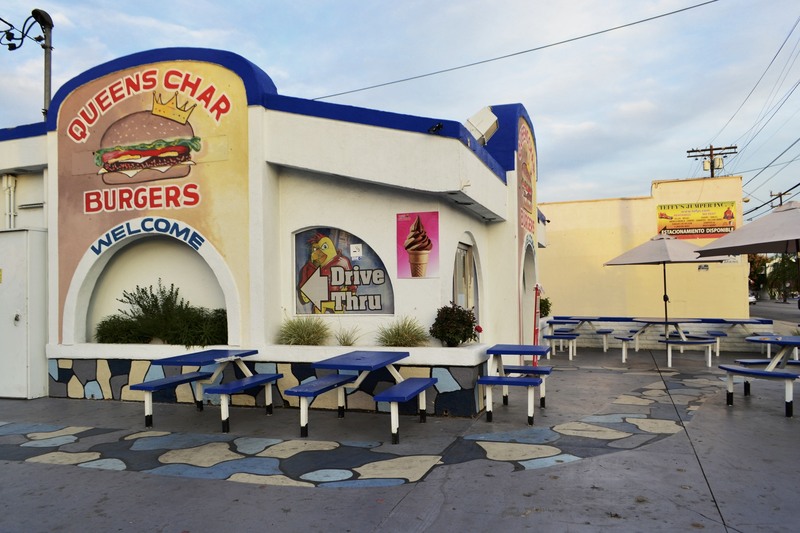 All over Los Angeles, the “rule” is that every large structure has to be divided into multi-colored bands of hues. If the White House were ever rebuilt in Los Angeles it would be drenched in six Dunn-Edwards earth tones. 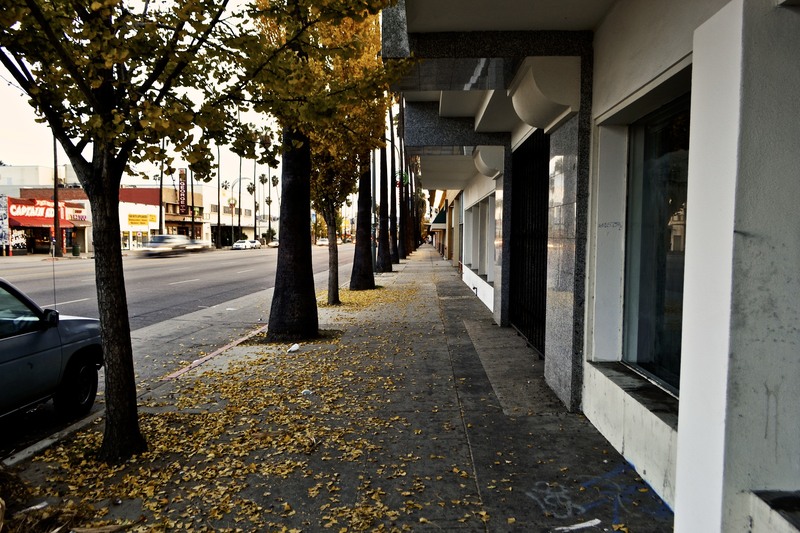 I wrapped up my daylight walk in urban Van Nuys, by going south down Van Nuys Boulevard, on the west side of the street, where empty storefronts met fallen leaves on a cloudy and cold autumn afternoon. There was not a single man or woman walking from Vanowen to Kittridge, and I did not encounter humans until I turned right, and found a lively bunch of food carts in the back parking lot. 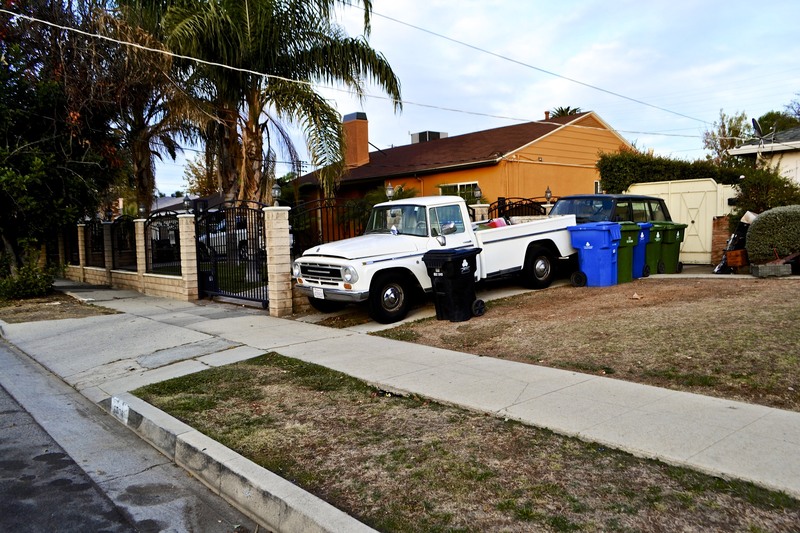 Spanish speaking people, who now predominate in Van Nuys, prefer enclosures, such as small streets, landscaped and illuminated alleys, and places where people walk. 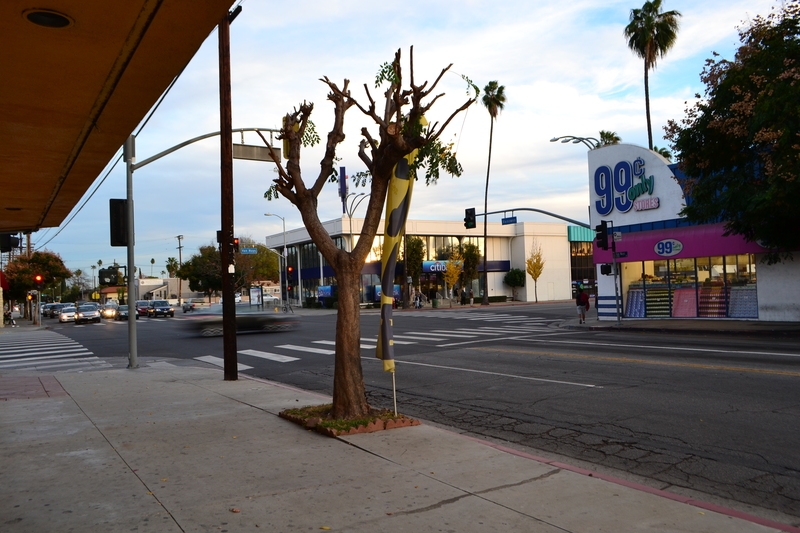 The much sought after revitalization of Van Nuys Boulevard will never occur because the street is too wide. The plazas of Spain, Mexico, Guatemala and El Salvador, not to mention the courtyards of any place other than the US, are the gathering places of urban dwellers, who come on foot to congregate, to shop, to watch, and to walk. 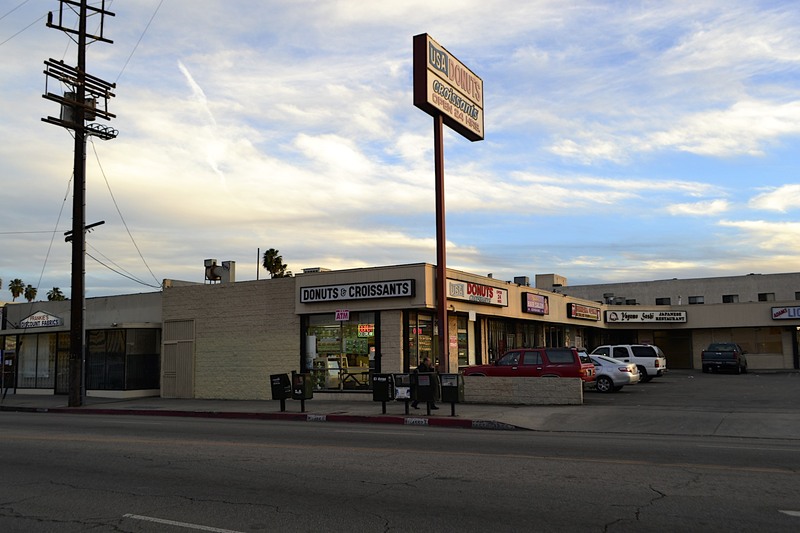 And so it was on a Sunday afternoon, when Van Nuys Boulevard was dead, the life of the city was conducted in back of stores, near the church, in places where the walls and the buildings provided enclosure, safety and structure. In any plan for the future, the planners should try to reduce the size of the streets, bring back small parks, small lanes, and narrow streets where a sense of community and walkability can be fostered. Your photos are so nice they almost make these streets look kinda cool. I live in this neighborhood. I’m a homeowner and I’m raising my family here, and all that you say is true. It’s very hard to comprehend that structure next to Wells Fargo (and it’s taking forever to be built). I so wish VN Blvd could be transformed into a pedestrian friendly shopping district; when I first moved here I saw the potential for it to happen, but in the last ten years I haven’t seen any shred of evidence that it’s headed in that direction. Sad. You have an interesting point about the back parking lot/plaza concept. 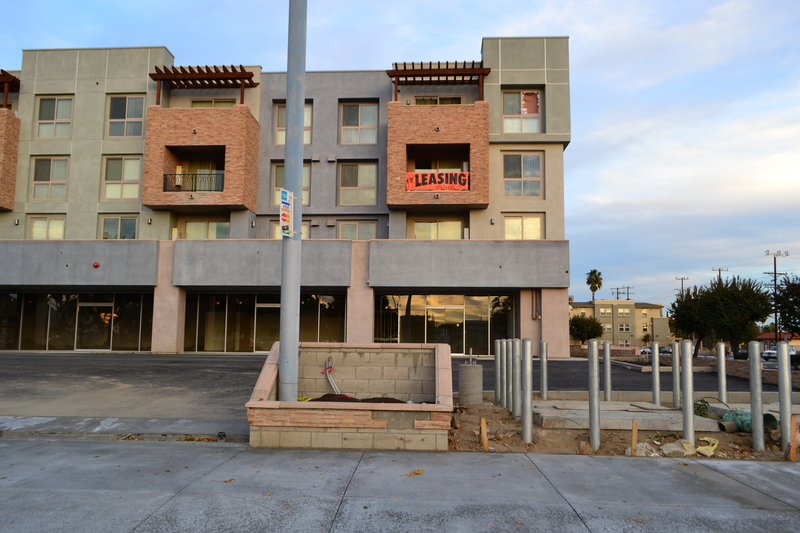 Plaza Del Sol up in Panorama City certainly took this idea to its next logical step. It’s been awhile since I’ve walked through that strip, but the tortas and melon drinks at Rincon Taurino are very good so maybe it’s time to make another visit up there. was an attractive, safe, “pedestrian friendly” environment. It was a prosperous, secure and healthy community. transnational organized crime and commercial slum-lords. Eliminate the rot. Healthy growth will return. Thank you for the great memories. Timing is everything…and so is blind dumb luck too. Businesses had welcoming and open front entrances. It was a prosperous, secure, healthy community. No more. organized crime and commercial slum-lords. I think the decay is largely on the main streets but when you go in back along the residential streets you don’t find that is has changed as much as it has on such boulevards as Victory, Vanowen and Kester. I was born and raised here in the 50’s, 60’s and part of the 70’s. Absolutely the best place ever to grow up in that time period. I lived at 14151 Haynes St. Times have changed but all of my memories are happy ones of my hometown. It makes me sad to see all of it has changed so much. My father and uncle used to own Mathews Shoe Repair on Gilmore. It is still there, but they are not. Thanks for the walk, I enjoyed it. Thank you Sue. Appreciate your comments.